Camera360 Ultimate 6.2.3 APK is the newer version which has better cloud performance. In this version the developer fixed app performance so it’s faster and better. 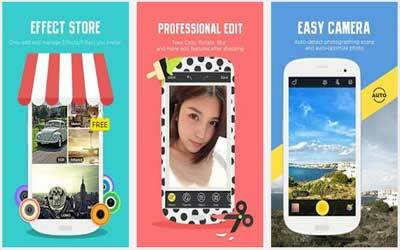 It is supported by the Camera Store that allows users to download new camera modes, namely Effect Cam, Cam Selfie, Easy Cam, Cam Scene, and more. Not only that, this feature also allows users to remove unused camera mode. In addition, it is also supported by Effect Store that provides hundreds of unique camera filter effects and professionals who are ready to transform an ordinary photo into a masterpiece of photography. Users can download various effects available for free. Great photo app. Take your time and play with this! You’d be amazed at how cool you can make a simple glass of water look.